To our unaccustomed eyes, Liverpool seemed architecturally divided, but as we ambled on down Bold Street, past Concert Square, cutting through a shiny shopping mall towards Albert Dock, which has the largest number of Grade II listed buildings in Europe, we realised that despite varying levels of character, these differences seem to intermingle more easily here than in other large UK cities we’ve seen. 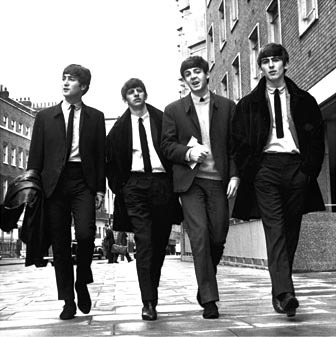 Differences made the world of difference in regard to the unique sound of The Beatles throughout their group and individual careers. So much so that a great and abiding love of their music continues to be shared and passed down from one generation of enthusiastic and loyal fans to the next. 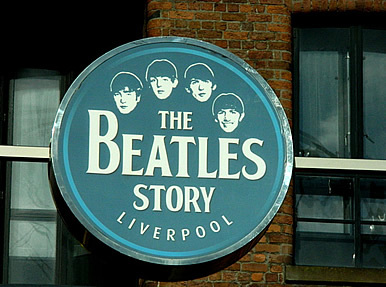 Nowhere in Central Liverpool is its’ compatible diversity more obvious than in the Cavern district, found via street signs clearly pointing to Beatles landmarks from the moment you alight at Lime Street. In closer proximity of said landmarks, smiles bloomed as profusely as flowers in spring, despite October chills, as visitors posed for photos and happily sang along to Beatles songs playing at the entranceway of award winning exhibition, The Beatles Story. Submerging myself in ‘Yellow Submarine’, with its’ kaleidoscope of entertaining sounds, I made my way down into the exhibition and was soon immersed in Beatles tales, which I’d previously heard of, but never considered via photos, anecdotes and genuine artefacts exhibited together. From what I experienced and witnessed, the combination of the three is a thoroughly delightful, almost rapturous experience for many Beatles fans who eagerly snapped photos of each display, savouring their every nuance. As if that isn’t enough, life size environments are also recreated here, such as a corner of the pre-Cavern coffee and cigarette laden teenage, member only Casbah Coffee Club, opened August, 1959, where The Quarrymen got their start, in the basement of the West Derby home of Mona Best, mother of pre- Ringo drummer, Pete Best. This section is especially affecting, as it contains actual coffee cups, ashtrays and furnishings from the club itself, where The Quarrymen really got their start and played many times thereafter, finally, as The Beatles. The Casbah Coffee Club’s place in popular culture was eventually recognised by English Heritage, who declared it a grade II listed building. 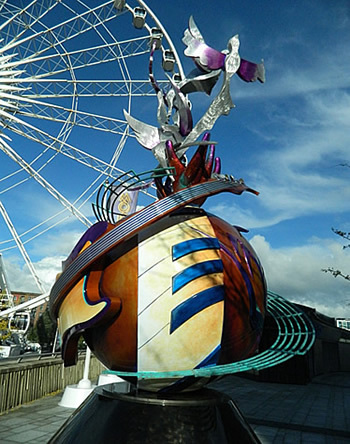 It was reopened by the Lord Mayor of Liverpool in 1999 for shows and tours, by appointment only. Each atmospheric exhibit in The Beatles’ trajectory explores a different turning point along their gradually ascending path. 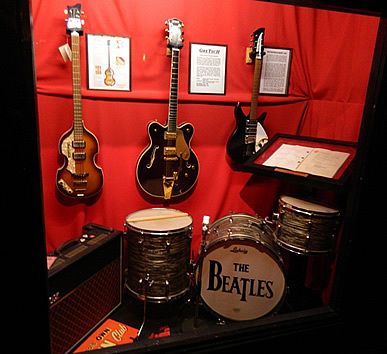 Also significant among them is a reconstruction of The Cavern Club in its original incarnation, where The Beatles played 292 times and were first seen by future manager Brian Epstein in 1961. A tawdry Hamburg street is also here, with accompanying photos and film clips showing Hamburg in the day. The Beatles initially played in clubs in the red light district there for several months, learning to put on a show and hone their skills, often playing eight hours or more a day, seven days a week! The well constructed displays give a real sense of being there, every step of the way with The Beatles. In the section on The Beatles conquering America, real airline seats with a ‘view’ of Manhattan from the windows and the actual New York radio broadcasts proclaiming what ‘Beatles’ time and temperature it was, advising listeners that the group had left the UK bound for JFK Airport, where 10,000 screaming fans greeted them are especially evocative. The Beatles conquering of America was complete in Feb. 1964, following their appearances for three consecutive weeks on the Ed Sullivan show which my family, like many others across the country watched faithfully every Sunday night. Though I was only a child at the time, I can still see The Beatles clearly in my mind on the occasion of their first TV appearance, as I’m sure countless other baby boomer/post war ‘kids’ on either side of the Atlantic can too. I was too young to scream over them then, but as I came of age, circa ’66 – ’70, The Beatles became mentors for me, my friends and millions of other American youths. Though the story of The Beatles is a remarkable one, their rise, however mercurial it may have seemed, was not overnight, as though it’s true their success was down to talent, it was also achieved through determination, hard work and resourcefulness. When sixteen year old John Lennon met fifteen year old Paul Mc Cartney, brought to Woolton Church Fete on July 6, 1957, where John and his Skiffle band were playing by a mutual friend, John could then only play a few banjo chords on his guitar, taught by his mother Julia. Paul was impressed by John’s singing and ability to make up words to songs to cover the fact that he didn’t know their real ones. John initially felt Paul’s good looks might be a threat to his leadership of his band, but he was impressed by Paul’s skilful playing and singing of a popular song. So, after a couple days he invited him to join his group, The Quarrymen, so named because the song of the school he attended began with the words, ‘We are the Quarrymen.’ When they needed a proper guitarist, Paul suggested his friend, George Harrison, then fourteen, who he’d met on the bus riding to the school they attended. Though John initially flinched at the idea of a ‘kid’ being in the band, when he heard George play, he changed his mind and the nucleus of The Beatles was formed. Following stints in Hamburg and gigs here there and everywhere round Liverpool, their popularity grew. By the time their first single ‘Love Me Do’ was released in Britain in 1962, they were on their way to drawing appreciative screams from fans not only in the UK, but also, around the world. All of the seminal moments from The Beatles career are represented in The Beatles Story, from that first fateful meeting of John and Paul, through the group’s break up and individual branching out, post Beatles. Authentic guitars and clothing, including John’s collarless mohair ‘Beatle’ suit, decor, music and ambience is all here, collectively comprising so much more than just a trip down memory lane, as it leaves visitors with a sense of each group member’s dogged desire to always, above all, be themselves. It’s a journey you may think you’ve already travelled through their music, but I can vouch for the fact that no matter what you think you know about The Beatles, you’ll find plenty of new things to discover, especially as you’re not likely to see as many genuine items from their lives and times as you will here. From their first single, through Let It Be and beyond to individual masterworks like George Harrison’s ‘My Sweet Lord’ and John Lennon’s sublimely hopeful ‘Imagine’, the stories behind the songs and their composers are here, tracing the highs and lows of their creations and, creators. I’ve never been to a museum before with such a feeling of kinship among its visitors. But as Paul McCartney said about The Beatles in retrospect in Martin Scorsese’s documentary about George, Living in a Material World, ‘The Beatles were all about love.’ On that note, I hope that when you go, you’ll to come out of it as I did, with a renewed sense of appreciation for the lives and work of these four individuals who created so many life-enhancing moments for so many people around the world through their music. The Beatles Story concludes, as John’s original body of work did, with a peaceful, yet poignant, powerfully moving tribute to the life of John Lennon artist and, man. As if the great displays in The Beatles Story aren’t enough, an additional exhibition on show at Pier Head, Elvis and Us, brimming with absolutely amazing Elvis Presley artefacts, among them iconic clothes, vintage personal items and records, explores the life and career of The Beatles’ great hero, his influence on them and their brief, one off, unrecorded meeting in August 1966. 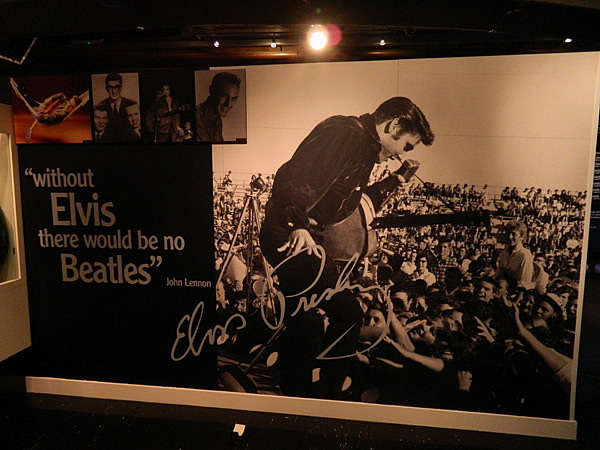 You can also watch the enjoyable Fab-4D animation in the cinema, which like the main exhibition and fascinating Elvis and Us really has to be experienced for yourself. When we rolled up for Magical Mystery Tour the next day, we were like walking Beatles jukeboxes, having replayed many of our favourite songs in our heads since our visit to The Beatles Story the day before, where they even pipe Beatles songs into the loos! Our tour began on a high with the song ‘Magical Mystery Tour’ the film of which I’d recently watched (for the first time) when it was shown on TV to commemorate the 50th Anniversary of the release of The Beatles first single in early October. Our entertaining guide, Neil, interacted with the driver Ross, sharing insider’s Beatles tid-bits while waving in the direction of Ringo’s childhood home destined, like the streets round it, for the wrecking ball, before the former Beatles’ street was scheduled to be saved for posterity. The Empress Pub on the corner, featured on the cover of Ringo’s first solo album, bears a sign proclaiming that he drank there. Onward we rode, past halls, houses, pubs, parks and shops made famous by association through interactions and, lyrics, such as those in ‘Penny Lane,’ along which nearly every shop seems to proclaim its’ locale in big bold letters, least we’d forgot its’ significance. Penny Lane has a roundabout where John, Paul and George, coming from different parts of town, converged to travel into Central Liverpool together as teenage Quarry Men. At points along our tour, we were offered a chance to get out for photos ops. Interesting among them for many, including me was the birthplace of George Harrison, a small unassuming row house, inhabited by people who must be quite accustomed to their home being stared at! The house doesn’t have a blue plaque, because, as our guide explained, you either have to be 100 years old, or dead for twenty years before the National Trust pays that honour. A pub round the corner from the former Harrison house has a large poster of the young Fab Four in their window. Another destination our coach emptied out for was ‘Strawberry Fields’ which in John Lennon’s childhood belonged to the Salvation Army a couple of streets away from the house he grew up in, the wall of which he and his friends used to scale to play in its leafy grounds. Small, red wrought iron gates, though not the original ones, set a mood. Graffiti from round the world adorns large brick posts on either side. After John’s death in 1980, his widow Yoko Ono and their son Sean rang up the children’s home occupying the grounds today, sending presents to the children there each year at Christmas, visiting them in person once. Plans are now underway to transform the grounds into actual strawberry fields, with the hope that the fruit could be made into jam to be sold in a purpose built Beatles display chronicling the song, to help the children’s cause. A new and exciting ‘Strawberry Fields’ complex is set to open up in 2015! Finally, after passing by Mendips, John Lennon’s childhood home and stopping off for photos outside 20 Forthlin Road, where Paul Mc Cartney came of age, we felt a distinct sense of timelessness. On the way to The Cavern Club, where our tour ended, we passed LIPA, Liverpool International Performing Arts school, formerly the Liverpool Institute Paul and George attended, recently meant for demolition but saved for a better purpose by Paul. The Empire Theatre with its lighted marquee, where The Beatles performed one last concert in 1964 following worldwide fame, added to the picture. 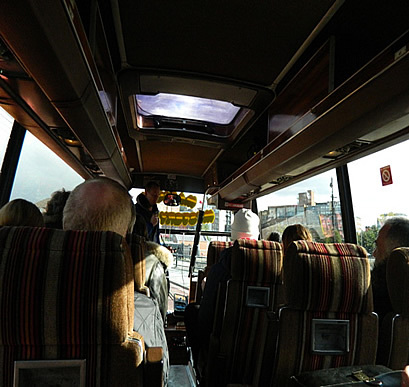 In most cases, riding along on this tour was a case of wistful glimpses, rather than lingering looks at the birth and times of The Beatles, though Neil’s entertaining, informative commentary added considerably to the experience. The Cavern Club, final stop on the tour, and its resurrected bricks (approx. 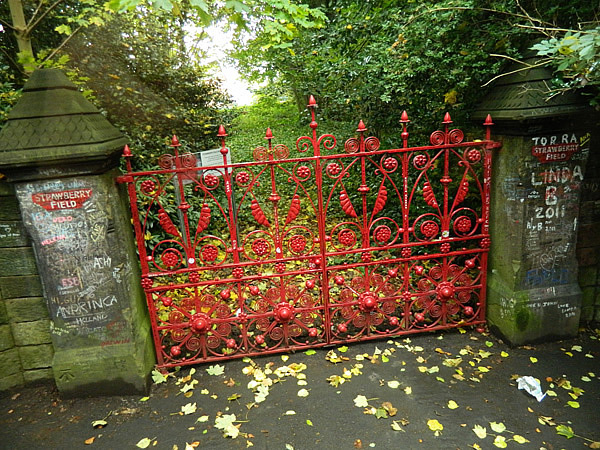 15,000 – most were sold for funding, with proceeds from 5,000 going to Strawberry Fields Children’s Home) helped form a good facsimile of the original, first opened in Jan. 16, 1957, closed in 1973 by order of British Rail, who wanted the space, then, changed their minds. The building housing the original basement club was senselessly razed and made into a street level parking lot, with its’ replacement re-opening in 1984, occupying almost 50% of the original site, before closing in 1989 for eighteen months, then reopening in 1991, under its present owners. Cliché, but true - everybody who’s anybody in the worlds of rock, popular music and R and B has played there, and the club’s ‘Wall of Fame’ is adorned with well known names like ‘Little’ Stevie Wonder, The Rolling Stones, The Who and many more to prove it! The Cavern Club’s cave like atmosphere mimics what the real Cavern was like, minus its’ condensation and dank smells, and resident rock items like one of B. B. King’s guitars and great photos and film footage of The Beatles and other groups, Mersey and otherwise helps bring its fascinating history to life. After a brief look round that afternoon, we returned for The Beatles tribute show that night, included in the price of our tour (£3.00 otherwise) and seeing Made in Liverpool do their thing was an enjoyable experience, though a tad dodgy at times, given the amount of booze drunk by some of the toughs in the crowd, drunk being the operative word. Be that as it may, Made in Liverpool did The Beatles proud, opening with ‘A Hard Day’s Night’, rolling competently through ‘I Feel Fine’, ‘Baby’s in Black,’ and other oft overlooked gems, moving forward in time for ‘Come Together’ and ‘Strawberry Fields’, then, easing back into Beatlemania with ‘I’ll Get You.’ Though their third set was meant to be pure ‘rock n roll’ which I would have loved to have heard, my motto is, when the drunks compete for the attention of the crowd around them in a club, it’s time to move on. That said, I’m sure there are many times when The Cavern Club is the place to be, as it seemed to be earlier that day and evening, as it’s an atmospheric place, full of rock history. In front of Jury Inn, where we were collected for our National Trust tour of The Beatles Childhood Homes, we paused to pay our respects at the John Lennon Peace Monument, ‘Peace and Harmony,’ near the Echo Wheel and Centre at King's Dock on the waterfront, dedicated by son Julian and first wife Cynthia in October 2010 to mark the occasion of John's 70th birthday. ‘Ticket to Ride’, followed by ‘Day Tripper’ played as our National Trust driver Andy drove us to The Beatles Childhood Homes on Friday, starting with Mendips, at 215 Menlove Avenue under a ‘blue suburban sky’, where John Lennon lived with his Aunt Mimi from the age of five when he was placed in her care, until he left home in 1964, at the age of twenty-three. For many, it almost seemed a shrine of sorts, and I confess to feeling a certain sense of awe in John’s former bedroom, with its’ guitar, copy of a childish thank you note, records, storybooks, magazines, cartoons by John and original wallpaper and posters, knowing that he’d written some of The Beatles best loved songs on his guitar in that little room. The fact that the room was recreated mattered not. I think there wasn’t a person out of the fifteen from our minibus who didn’t feel an almost palpable sense of loss in that room. Looking at personal family photos in albums on the dining room table downstairs, one of John on his 21st birthday at Mendips, another of him and baby son Julian in 1963, furthered that feeling. Colin was our respectful, informative guide at Mendips, who, prior to taking us through its’ downstairs rooms, thus enabling us to wander around the rest of the house on our own, enlightened us as to Mimi’s expectations of John, his love for his erratic mother Julia and the tragedy of her death, at forty-two by a speeding car outside the house when he was fifteen. Also detailed were the sacrifices Mimi made to keep Mendips when her husband, John’s Uncle George died at the age of fifty–two and, most intriguing of all, Mimi relaxing her usual classism enough to allow a polite ‘Council Estate’ boy named Paul Mc Cartney to visit John when they were both young teenage aspiring musician/song-writers struggling to create their own sound. The Quarrymen often rehearsed in the small enclosed porch at Mendips. The childhood home of Paul Mc Cartney, less than a mile from Mendips, at 20 Forthlin Road, is a comparatively plainer 1950’s terraced row Council house, with furnishings chosen to capture the moods of their time and former inhabitants, who, following the death of Paul’s mother, Mary a little over a year after they moved in, consisted of Paul’s father, Jim, him, and younger brother Michael. At Mendips, several pieces of furniture, looking very at home there, really belonged to Mimi, left to her nephews when she died in 1991. At 20 Forthlin Road, we were treated to a full tour, courtesy of Sylvia, who made an excellent job of it, reminding us that she is of The Beatles generation via her knowledge and enthusiasm for her subject matter. Sylvia described the working class way of making a house a home utilising end of roll wallpapers, different patterns for different walls, and the use of carpet remnants, sewed together to form a warming whole. Family photos, taken by Paul’s brother Michael add intriguing decoration, often illustrating amusing and/or creative incidents described on the tour. Notable among these is a candid pair of photos of two engrossed teenage boys named Paul and John taken while they were thoroughly absorbed in writing a song called ‘I Saw Her Standing There.’ Paul still has the notebook shown in the photos. Given the level of fame they attained, The Beatles all eventually moved their families to other addresses, more out of the way and, hopefully, unknown to their screaming, sometimes hysterical fans. 20 Forthlin Road was acquired by the National Trust in 1995, when the family living there after the Mc Cartneys moved out, and it was opened to the public in 1998. As at Mendips, the bed in Paul’s former room is strewn with records, music magazines, and a close facsimile of one of his earliest guitars. There’s a real lived in, homey feel to this place that lingers as you move through it, saying this house was once a home. When Mendips, John Lennon’s childhood home became available in 2002, it was purchased by his widow, Yoko Ono, who donated it to the National Trust. As Yoko explained, ‘When John’s house came up for sale I wanted to preserve it for the people of Liverpool, and John Lennon and Beatles fans all over the world.’ John often spoke fondly of his time there, and he and Yoko had gone as far as to drive there and sit outside while he shared stories about the happy days he’d spent there, but they didn’t go inside because it belonged to other people then. John’s cousin, Michael Cadwallader, oversaw the recreation of the rooms’ interiors as they were during John’s youth there and following its attentive restoration, Mendips was opened to the public in 2003 in tribute to John. Some of the Mendips artefacts John kept in boxes at the Dakota, where he lived with Yoko in New York City are now on show at his former home. As Colin said at the start of our visit, ‘we owe Yoko a debt of thanks.’ John wrote ‘Please, Please Me’, The Beatles first U.K. number one hit, among other well loved Beatles songs, in this house. John Lennon and Paul Mc Cartney went on to write ‘She Loves You,’ and other early Beatles classics, going between Mendips and 20 Forthlin Road, as you should do too, in order to feel the vibe of their lives and work. It’s the crème de la crème of Beatles experiences, and one you’ll never forget, in keeping with fond memories of The Beatles and their musical legacy. Editor’s note: The Beatles, as a group and as people were and always will be John, Paul, George and Ringo to me, no disrespect intended, on the contrary.